Federal census, 1940, 503 A St., S.E., Washington, D.C.
Francis E. Knott (rents, $50), head, 31, married, completed 2 years of college, born in D.C., lived in same house in 1935, policeman, D.C. police, worked 52 weeks in 1939, income $2,300. Anna T. Knott, wife, 35, married, completed 8th grade, born in Irish Free State, naturalized citizen, lived in same house in 1935, not employed. Francis E. Knott, Jr., son, 4, born in D.C.
Patricia A. Knott, daughter, 1 month, born in D.C.
Anna M. Smith, stepdaughter, 18, single, completed 3 years of high school, born in D.C., lived in same house in 1935, not employed. Dorothy L. Smith, stepdaughter, 13, completed 7th grade, born in D.C., lived in same house in 1935. John J. Dugan, brother-in-law, 39, single, completed 8th grade, born in Irish Free State, naturalized citizen, lived in same house in 1935, carpenter, D.C. WPA project, worked 52 weeks in 1939, income $1,800. 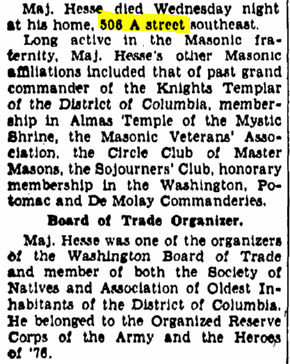 Washington Post, 27 November 1936, p. X4. 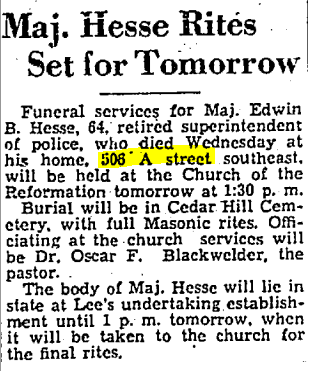 Washington Evening Star, 27 November 1936, p. 36. Washington Evening Star, 28 November 1936, p. 18.